"That was really no surprise" said a delighted Allison Sheehan as the tough and consistent Izenashark put in a bold display to win a BM70 contest in easy fashion at Mornington on Monday. Straight to the lead, the six-year-old set up a good pace, giving his rivals every chance to make ground on him, but he just kept going with his winning margin being a soft 3/4 length. Recording his second win in a metropolitan graded race and his seventh overall, Izenashark took his prize money tally to beyond $168,000 - a great effort for Mordi Wanhope's home-bred by the Listed winning Redoute's Choice stallion Sharkbite. "He loves it here at Mornington," Allison said, "and he has been running in super form. He loves a bit of cut in the track and has been consistent this who preparation." 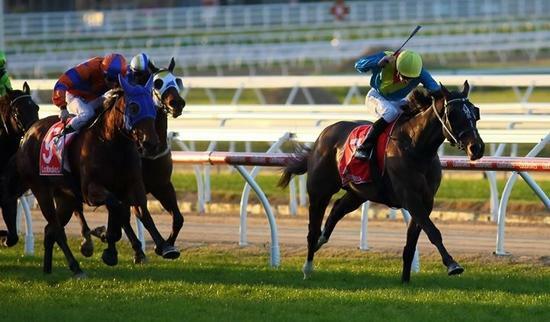 As her racing.com interview was drowned out by the applause and cheers of Izenashark's happy owners, Allison said that a race at Moonee Valley in a couple of week's time is now on the agenda - "it is the same sort of race and we might have to look at claiming now." Riding the bay for the first time, Jake Noonan was always happy in running - "he found a comfortable rhythm in front and when he gets left alone for a few furlongs he has enough up his sleeve to kick away." "That was no easy race on paper," he added, "and credit to Allison - he has been up a while and she has done a fine job keeping him in good order." A half-brother to two winners, Izenashark out of the retired two times winning State Of Kings mare Lady Zena.